Traders work on the floor of the New York Stock Exchange, which has seen a topsy-turvy couple of days, on Tuesday in New York City. Treasury Secretary Steven Mnuchin avoided the subject in prepared remarks to the House Financial Services Committee. When pressed, Mnuchin told lawmakers that the market is not cause for concern. "First I would say, we are very focused on the long-term economic growth and we believe that the policies that we've enacted, including tax reform, are very positive for long-term economic growth," Mnuchin told lawmakers. "The stock market is up significantly — over 30 percent — since President Trump was elected. We're monitoring the stock markets. They're functioning very well." White House press secretary Sarah Huckabee Sanders also tried to redirect the conversation after the Dow plunged 1,175 points on Monday. "The economy is incredibly strong right now. The president's focus continues to be on the long-term economic fundamentals," Sanders told reporters Tuesday. She pointed to last week's jobs report, which showed unemployment hovering at a 17-year low and wages growing at their fastest pace since 2009. "There's nothing that's taken place over the last couple of days in our economy that's fundamentally different than it was two weeks ago and we're very comfortable with where we are right now." "The stock market has smashed one record after another, gaining $8 trillion and more in value in just this short period of time," Trump boasted during last week's State of the Union address. "The great news for Americans — 401(k), retirement, pension and college savings accounts have gone through the roof." At a factory tour in Pennsylvania last month, Trump kidded workers about the stock gains in their retirement plans. "You're brilliant investors," the president said. "I've had people come up, 'Sir, my wife thinks I'm the most brilliant investor because I made 42 percent in the last 10 months.' And that's pretty good." 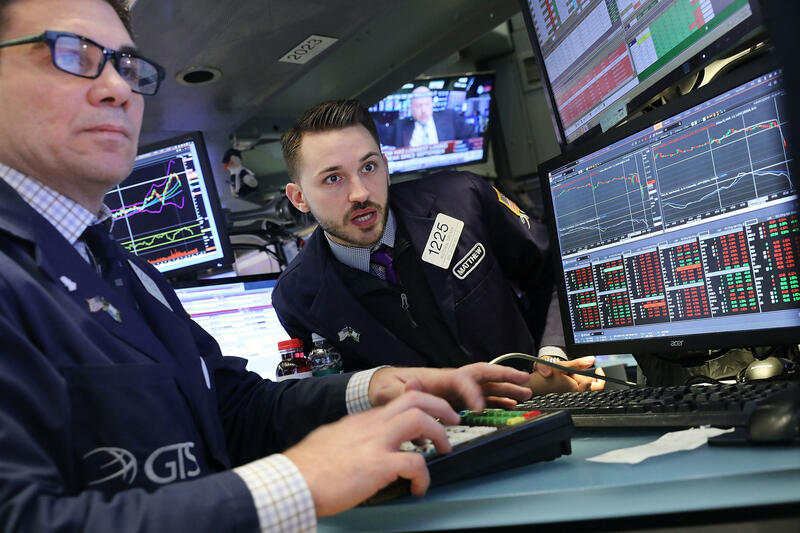 It's not as if stock market volatility is a surprise, even if the steady gains of the last year had lulled many market watchers into a false sense of complacency. Many observers warned for months that Trump's celebratory tone could backfire when — not if — the market inevitably suffered a downturn. "Now that Trump has eagerly claimed credit for instilling investor confidence and driving share prices to fresh highs, he stands to take the blame if markets hit a rough patch and decline," cautioned Ben White in Politico. That was in August of last year, when the Dow had just crossed 22,000. "Everybody's got to remember that the markets go up and the markets go down," said former Obama White House economist Austan Goolsbee in an interview with Morning Edition on Tuesday. "On average, they tend to go up, but there's a lot of volatility." Trump himself was wary about that in his private life. He told Fox Business Network in 2016, "I've never been a big investor in the stock market." Stocks and mutual funds accounted for a small fraction of the real estate mogul's personal fortune. According to a spokesman, Trump liquidated his stock holdings in the summer of 2016. That puts him in good company. Nearly half of all Americans don't own any stock. And stock ownership is heavily concentrated among the wealthy. That is another reason many presidents avoid talking too much about the market. It's simply not the most important indicator to many of their constituents, who are likely to be more interested in what is happening with jobs and wages. "We saw a decent jobs number this last [week]. And we have seen in the last couple of years wages starting to inch themselves upwards," said Goolsbee, a University of Chicago economist who served as adviser to former President Barack Obama. "So what happens in the stock market does not have to be an indicator for what's happening to everyday people in the economy."